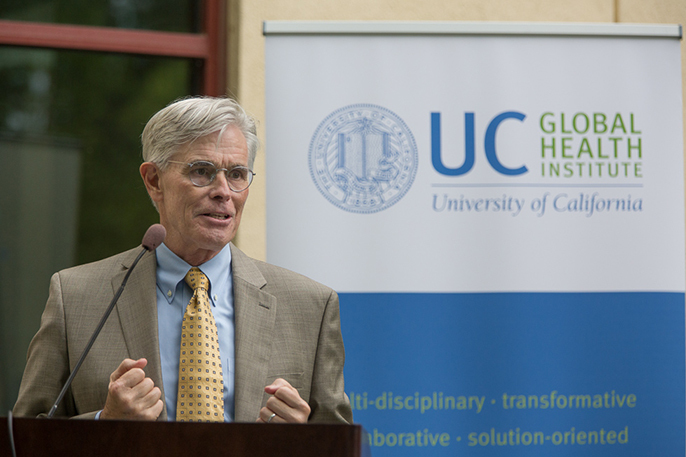 UCLA's Thomas Coates has been named director of the UC Global Health Institute. UCLA Center for World Health Founding Director Thomas Coates has been named director of the University of California Global Health Institute. Coates succeeds the institute’s founding director, Dr. Haile Debas of UC San Francisco, who will become director emeritus after playing a pivotal role in launching the systemwide institute in 2009 and guiding its growth. Coates, who previously served as the institute’s co-director, will be responsible for providing executive strategic, operational and resource management leadership for the institute. In addition, Dr. Craig Cohen, professor of obstetrics and gynecology at UCSF, and Dr. Patricia Conrad, professor and associate dean for global programs at the School of Veterinary Medicine at UC Davis, will serve as the institute’s co-directors. Cohen previously served as co-director of the institute's Center of Expertise on Women's Health and Empowerment and Conrad served as co-director of the Center of Expertise on One Health. In their new role, they will work closely with the director to manage the institute’s operations. Steffanie Strathdee, associate dean of global health sciences and Harold Simon Professor and chief of the Division of Global Public Health, UC San Diego. The board, which is responsible for providing guidance to the institute in overall policy and direction in meeting organizational goals, is chaired by Mary Croughan, executive director of the Research Grants Program Office at the UC Office of the President.